FILE: Native American delegates from Washington state listen to the national anthem, sung in the traditional Tohono O'odham language, during the Democratic National Convention in Boston, Tuesday, July 27, 2004. In November 2012, former North Dakota attorney general Heidi Heitkamp, a Democrat, won a hotly-contested race for a seat in the U.S. Senate, a win attributed to the state’s Native American voters. Shortly after that, lawmakers in the majority Republican state passed a tough voter-ID law, making it a lot harder for tribe members to vote. The nonprofit Native American Rights Fund (NARF) sees the new law as racially motivated and has taken North Dakota to court. 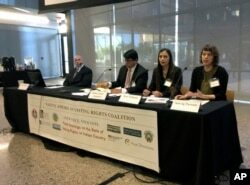 This year, NARF conducted field hearings across Indian Country to hear testimony on voter suppression in other states. “And what we heard was really disturbing,” said NARF attorney Jacqueline D. De León, a member of the Isleta Pueblo in New Mexico. The 1965 National Voting Rights Act (NVRA), amended several times, was intended to end discrimination in voting. 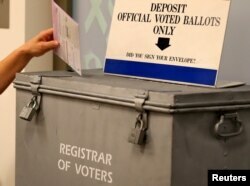 The law requires states to provide voter registration forms in all public offices. Tribes are sovereign, which means they have their own officials and voter registration systems to elect them. Many tribe members don’t realize they also need to register for local, state and general elections, because officials rarely conduct voter registration drives on reservations. Activists report challenges when they intervene to help. A view of the Hualapai Indian Reservation from the Grand Canyon West, Ariz. Many tribes are located on rural reservations, remote from polling places, which discourages members from voting in local, state and national elections. In Arizona, a state that allows voting by mail and has the third largest Native American population in the country, Republican lawmakers in 2016 made it a felony for non-family members to mail or deliver someone else’s ballots to polling places. 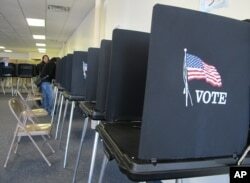 State lawmakers said they wanted to prevent voter fraud. Democrats and Arizona tribes claimed it was an attempt to suppress the minority vote. In 2013, the U.S. Supreme Court invalidated a key NVRA requirement that certain state and local jurisdictions get “preclearance” from the federal government before making any changes to voting laws and procedures. “That’s when preclearance states began enacting really stringent laws, disenfranchising Native and other minority voters, even deleting names from voter rolls,” said De León. Natives face challenges on election day, such as fewer early voting hours, a scarcity of nearby polling places, and poll workers who don’t speak Native languages. In 2014, Buffalo County, South Dakota, refused to place a ballot box on the Crow Creek Indian Reservation, whose 2,000 members make up 85 percent of the county’s population. But De León said officials were willing to place a ballot box in a community miles away, where the total population was only eight people, all non-Native. A ballot is placed into a locked ballot box by a poll worker as people line-up to vote early at the San Diego County Elections Office in San Diego, California, US, Nov. 7, 2016. “And at a certain Wisconsin reservation, local authorities put the nearest ballot box inside the sheriff’s office,” said De León. “And on election day, police were positioned just outside of the reservation, pulling people’s cars over and checking tags and licenses - basically making people afraid to go off reservation. In 2014, Pima County, Arizona, sympathetic to local tribes, appointed Jason Chavez from the Tohono O’odham Nation as a tribal voter outreach coordinator. Chavez also worked with tribal and district officials to provide transportation for tribe members who didn’t have cars. His efforts paid off with a 300 percent increase in early voter turnout on the reservation. Elsewhere, Utah Navajos forced San Juan County to redraw voting districts that had been configured to prevent them from holding office. And in 2014, NARF won a lawsuit filed on behalf of Alaska Natives, forcing the state provide voting information in the Yup'ik, Inupiaq and Gwich'in languages. Courtesy graphic from the National Congress of American Indians, whose #NativeVote campaign seeks to improve Native American and Alaska Native access to the ballot box. 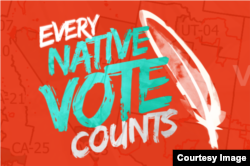 The National Congress of American Indians (NCAI) has launched a national #NativeVote campaign to mobilize tribes and help Native voters navigate the election process. NCAI also encourages Native Americans to run for public office, a campaign that looks to be paying off. A record number of Native Americans are running in midterm primary elections. So far, two women, Sharice Davids of the Ho-Chunk Nation in Wisconsin and Deb Haaland of the Laguna Pueblo in New Mexico, have won the Democratic Party’s nomination for seats in the U.S. Congress. Two Native women are party nominees for governor, Democrat Paulette Jordan of the Coeur d’Alene tribe in Idaho, and Republican Andria Tupola, a Native Hawaiian, in Hawaii. And four Native women are nominees for Lieutenant governor in Alaska, Minnesota and Oklahoma.